For all affected by the anti-G8 march at Auchterarder on the first day of the G8, it was a day of uncertainty and contrasting images. Protesters heading for the organised demonstration probably woke on Wednesday, satisfied that they had won the right to protest close to the venue for the G8 summit. However, early morning violence by some anti-G8 protesters elsewhere threw that plan into doubt and the police, at one stage, pulled the plug. The Auchterarder protesters eventually got their wish but the contrast came when a predominantly peaceful march was affected by some of the disorder seen elsewhere. Safety and order was paramount for police in Auchterarder and, with serious violent confrontations ongoing in Stirling, perhaps they could not be blamed for feeling twitchy. Could safety be guaranteed during the planned G8 Alternatives demonstration in a village 10 miles north of where officers were putting their G8 public order training into practice? Many demonstrators in Auchterarder were at pains to stress that they were not there for trouble but had a message to deliver to world leaders. 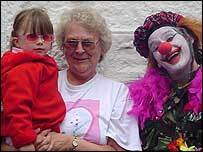 Indeed, members of the Clown Army, which had been evident in Edinburgh, kept local children entertained as they waited for a "yes" or "no" answer from organisers who were meeting police to discuss the fate of the march. Residents we spoke to before Wednesday said they would keep an open mind. "We are not their enemy," one shop owner told me last week as he stocked up on supplies to sell to the expected 5,000 visitors, plus a strong number of media teams. By 1000 BST, a small number of demonstrators against the G8 could be seen cycling through the village. Dressed in colourful costumes and carrying a rainbow flag emblazoned with the word "peace", they danced along the High Street followed by curious stares as their stereo blasted out the cartoon song "Who's afraid of the big bad wolf?". Numbers began to steadily swell, with the arrival of 35 busloads from Edinburgh and Glasgow and a 4,000-strong crowd congregated in the village park. A final (final) decision from police reversed an earlier "no" to a "yes" and after a short delay - a policewoman had to be treated on the route for leg injuries after a colleague in a police car accidentally knocked her over - the group began to move. Chants ranged from "people have the power, we're growing stronger by the hour", to "drop the debt" and "can you hear us in Gleneagles?". All in all, it was good-natured and peaceful as local people lined the streets to wave the marchers off, some even joined in waving to friends taking pictures of them from windows of nearby houses. The event was far smaller than Saturday's Make Poverty History march in the capital and far quieter too. Samba bands do not travel well, which is good news for those with sensitive hearing. Perhaps the biggest contrast, though, was the lack of aggression and violence in the main parade. 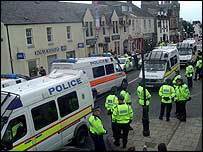 Tension was all too evident in areas around Stirling and in Edinburgh two days before. Anti-G8 campaigner and MP George Galloway said: "There is no violence here. The only violence is inside the minds of the eight men meeting in the hotel nearby." Another protester told me: "We wanted to come here and march. We've done that. It's been a great day." Others, however, were not content with following the planned route, which took them no closer than 500 yards to the Gleneagles complex. A strong police presence stood behind temporary fencing - officers on foot supported by colleagues in full riot gear and backed up by intimidating lines of others on horseback. Their message was clear - Thou Shalt Not Pass. Yet some did. A large number broke off from the main route and managed to breach the outer security cordon before being pushed back by police in riot gear with dogs after rocks and stakes were thrown. On the village high street, shops that had opened stayed open and protesters who had followed the official march route filed into chip shops and coffee houses before boarding their buses home. Local people continued about their daily business, only looking up when the odd clown cycled past. Perhaps this is premature but, casting my mind back to previous G8s and the levels of violence witnessed in Genoa in 2001 and Seattle in 1999, a question forms - will Gleneagles set an example for how future G8s should be policed? Yes, there have been clashes and yes police have responded - too harshly in the eyes of some. But no bullets or baton rounds have been fired. Water cannon are not in sight. Nor has CS gas been sprayed. Officers on foot, backed up by colleagues on horses and dog handlers have kept the worst of the trouble at bay with minimal injuries on both sides. Protesters have kept their democratic right to march near to the summit venue and eased the fears of Auchterarder locals with their friendly nature towards villagers. "We're still standing," one elderly lady told me with a relieved smile as she walked her dog in the park where a small number of protesters remained singing songs and swapping stories. And with day one of the summit nearing its end, there is growing confidence in Auchterarder that it might just stay that way.